Thank you for stopping by! I am truly humbled by your presence and forever grateful for the love and attention 'P is for Party' has received. 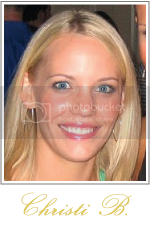 I started this blog in May of 2009 as a creative outlet for myself to share with people my love for entertaining. 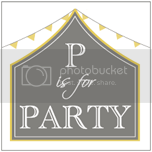 Here you will find lots of real party inspiration along with tips, DIY projects, seasonal décor, recipes and much more! 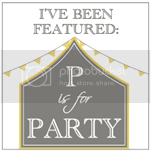 It’s my hope that 'P is for Party' will be one of your go-to guides for entertaining inspiration. My love for party planning started at a very young age and I have my mom to thank for that. She always hosted the most fabulous parties for our family. I was that girl who started planning her wedding before she even met the man she was going to marry. Soon after our wedding, I went to work for the same boutique wedding firm, Belle of the Ball, who helped coordinate our special day. It was a tough decision to leave the industry, but I knew I wanted to focus all of my time and attention on being a mom once our children arrived. The party planning itch has never left and the pull has been strong. That is what brought me here to you! Thank you for stopping by each day and for giving me a reason to write!